Search Tags: Jagadhatri Puja Trains, EMU Local Trains from Howrah (Kolkata) to Chandannagar for Jagadhatri Puja Trains timings time table Howrah Bandel Burdwan Local Trains Jagadhatri Puja Krishnanagar Ranaghat Sealdah Station Trains Time Table Chart Timings of Special Trains for Jagadhatri Puja. 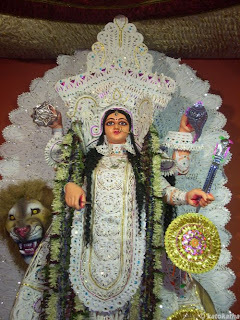 Jagadhatri Puja of Chandannagar of Hooghly district and also the Jagadhatri Puja of Krishnanagar of Nadia district is the best Jagadhatri Puja happening in West Bengal. Tourists come from Kolkata, Howrah, West Bengal, outside West Bengal and also Foreign tourists used to come to see the excellence of Jagadhatri Puja at Chandannagar & of Krishnanagar during the Jagadhatri Puja celebration that happens for 4-days (starting from Sasthi, Saptami, Astami & Nabami) like Durga Puja. Apart from Sasthi, Saptami, Astami & Nabami of Jagadhatri Puja in Chandannagar, thousands of visitors gather beside G.T. Road and Chandannagar Stand (beside the River Ganga) whole night on Jagadhatri Puja Dasami to see the live procession of Jagadhatri Idols on Trucks along with exclusive creation of lighting. This is why Indian Railways allots special trains to Chandannagar Railway Station from Howrah (Kolkata) & from Burdwan for the visitors and also Special Trains to Krishnanagar Station from Ranaghat allotted every year. Bandel Local Train from Howrah to Chandannagar for Jagadhatri Puja starts at 5:55pm, 11:30pm, 00:15am (midnight), 1:15am (late night). Remember, all other scheduled Trains to Chandannagar from Howrah will remain same and these 4 new special trains will be added in the Train list for Jagadhatri Puja. Bandel Local Train from Bandel Station – Chandannagar – Howrah (returns) for Jagadhatri Puja starts at 4:30pm, 1:00am (late night), 2:00am (late night), and 11:53pm (night). Remember, all other scheduled Trains to Chandannagar from Bandel (Howrah returning) will remain same and these 4 new special trains will be added in the Train list for Jagadhatri Puja. Jagadhatri Puja Special Train to Chandannagar Station from Howrah (Kolkata) on Bijoya Dasami will leave Howrah Station at 2:35am (late night) and the returning train from Bandel to Howrah will leave Bandel Station at the morning 4am on Jagadhatri Bijoya Dasami via Chandannagar Station. A special train from Burdwan will leave Burdwan Junction Station at 10:10pm on Sasthi, Sapatami, Astami, Nabami & Bijoya Dasami days of Jagadhatri Puja towards Chandannagar and all other trains will give stoppage in all stations during the Jagadhatri Puja. On the auspicious occasion of Jagadhatri Puja at Krishnanagar few special trains is also allotted to Sealdah Division’s Ranaghat to Krishnanagar Station. The special train will leave Ranaghat Station at 00:16am (midnight) to Krishnanagar and the returning train will leave Krishnanagar Station at 11:35pm night towards Ranaghat Station. Wish you all a happy Jagadhatri Puja and have a Safe Train Journey to Chandannagar or Krishnanagar during Jagadhatri Puja.